It took a few days but it looks like the party boat fleet has dialed in on a big area of salmon. Johnny on the New Ray Anne ran south to the Deep Reef on Thursday 4-19. He said they threw in 7 fish in the first few minutes then the fish went down and they scratched out 10 limits to 11 pounds. Jared Davis on the Salty Lady whom is currently running from Half Moon Bay reported 7 early limits to 14 pounds. Both were trolling inside the Deep Reef in 35 fathoms roughly 7 miles WSW of Pillar point. Johnny reports that there are reports of fish all the way down to Ano Nuevo and bait sings are improving. All party boats have lots of room through the end of the month. Pick a good weather day and you should be rewarded with a limit of salmon! The season then reopens on May 18th. The salmon season opened today with a few boats running south to the Deep Reef and scoring + - fish per rod action. Considering that the winds have been howling and water temps dropping the past few days boats found goog action. we are very optimistic about the days to come with better weather and warmer water temps. The bulk of the fleet was fishing 20 miles south of the Gate on the top side of the Deep Reef. 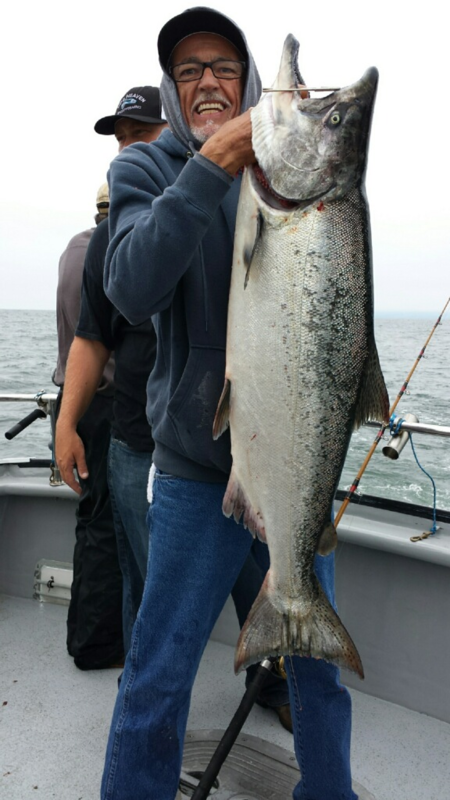 Out of Emeryville the Pacific Pearl reported 13 salmon to 14 pounds for 17 anglers. Most were hooked on straight bait and were fighting aggressively. They released as many fish in the 20-23" and lost a bunch of others. Emeryville also had three boats out on potluck trips who combined for 73 LIMITS of stripers and 21 halibut. The winds have been howling the past few days. We are currently (Thursday 4-11) seeing 25 plus knots wind offshore but......... there is some good news. For those anglers who booked opening day the optimist hope of salmon for dinner here is the good news. The forecast calls for the winds (south of Pt Reyes) to drop to 10 to 20 knots on Saturday's opener. This will allow party boat skippers to at least work the outer Marin coast to N Buoy / Pt Reyes waters. Private boaters need to be patient and wait for better conditions. Its going to be a long productive season. Emeryville sportfishing has space opening week. Jared Davis on the Salty Lady is currently from Half Moon Bay. He is running weekday salmon trips and whale watching trips on the weekends. The rockfish season opened today April 1st with great weather and action. Emeryville Sportfishing had two boats out today the Sea Wolf with 32 limits of rockfish and 17 lings to 16 pounds and the 18 limits of rockfish and 11 lings to 13 pounds. The weather was great and the forecast looks great through Wednesday / Thursday. Emeryville is currently booking salmon trips and rockfish. The salmon season starts April 13th and we expect a great opener. Until then it's white meat. Jared on the Salty Lady will be running daily for salmon out of Sausalito beginning April 13th. We heard some great news from the Vancouver PFMC meeting on Tuesday 3-12. All three of the season options are very similar. The first two options call for an April 13 through October opener with a 24" minimum size limit through May then dropping to 20" in June. The third option has a three week closer in early June but with the first two options being virtually the same, the odds of a full season are in our favor. This year does to look to be the best since 2012 and anglers should find plenty of opportunities for limits. Party boats are now booking trips for the opening weeks of the season. Prime summer dates during the peak of the run will likely be selling out fast. We will have regular reports available soon. The rockfish season opens on April 1st. Jared Davis on the Salty Lady is currently booking salmon trips. The Emeryville Sport Center will have multiple boats available for salmon, rockfish and bay potluck trips. See contact info in the links at the top of the page. Santa Rosa, CA -- Today officials forecast 379,632 adult Sacramento Valley salmon are now in the ocean off the West Coast, compared to 229,400 a year ago at this time. This suggests a return to relatively plentiful salmon fishing in 2019 is likely. In the month ahead, officials with the Pacific Fisheries Management Council will use this forecast and other information to set times and areas open to both sport and commercial ocean salmon fishing for 2019. The reason for the uptick in this year’s salmon forecast is directly linked to the better Central Valley river conditions during the very wet spring of 2017. Increased natural runoff from rivers in the Central Valley always boost salmon survival, as measured two years later when the fish return to spawn as adults. “We are looking forward to a good salmon fishing season this year,” said GGSA president John McManus. In addition to the Sacramento salmon forecasts, more salmon from other Central Valley rivers and hatcheries, as well as from the Klamath and other north coast rivers, will add to ocean numbers. The less good news is that the number of adult salmon that returned to the Sacramento Valley to spawn in 2018 fell short of targets for the fourth year in a row. After three years of missing the target, the National Marine Fisheries Service increased the so-called minimum escapement target from 122,000 to 151,000 fish in 2018. They may do the same again this season which could result in a shortened season or some areas being closed. These decisions will be made over the next month but no matter what, most expect good fishing once the season finally gets under way. In spite of the relatively rosy 2019 forecasts, the entire Central Valley is still recovering from the last great drought which greatly reduced salmon in various Central Valley tributaries. A few years of good returns to help rebuild the natural spawning stocks is welcome news. Over diversion of the Central Valley rivers in years with less rainfall is a major reason for declines in the salmon population. The State Water Resources Control Board is currently trying to rebalance how water is shared in the Central Valley. GGSA is working to make sure the needs of salmon are heard in this process. Currently, California’s salmon industry is valued at $1.4 billion in annual economic activity in a normal season. The industry employs tens of thousands of people from Santa Barbara to northern Oregon. This is a huge economic bloc made up of commercial fishermen, recreational fishermen (fresh and salt water), fish processors, marinas, coastal communities, equipment manufacturers, tackle shops and marine stores, the hotel and food industry, tribes, and the salmon fishing industry at large. Salmon are a keystone species that reflect the health of both their fresh and salt water environments. In March the Pacific Fishery Management Council will release their three options for the coming year. I am expecting that these options will each include a shorter ocean season and a possible one adult / one jack limit in the rivers. The 9th annual GGSA dinner is on Friday April 12th at the Friedman Center in Santa Rosa. This dinner supports GGSA's work to rebuild our Central Valley salmon runs and habitat they rely on. This fun event includes tons of raffle prizes, great vacation packages and delicious dinner catered by Lombardi's. Individual tickets are $85 or reserved table seating for ten for $935 which includes $200 in raffle tickets. If you would like to support the cause and help by donating fishing trips, goods or gear or your vacation home to an upcoming dinner auction. All donations are tax deductible. Please contact our events coordinator Cat at 855 251-4472 or at cat@goldengatesalmon.org. Heather Sears has been fishing for salmon out of this unassuming coastal community for nearly two decades. This year, for the first time since she arrived in 1999, she won’t be going out to sea. “I just didn’t think we’d have much fish this year,” she was telling me in a chilly backroom of her newly opened fish market on the Noyo River, Fort Bragg’s marine thoroughfare. As she spoke, she expertly sliced into triangular fillets ideal for sashimi a 90-pound albacore that a tuna boat had caught off Hawaii and delivered to her fish market. But what was on her mind was the threat to the industry she had grown up in. The state’s designated commercial salmon season, which normally runs from May 1 to Sept. 30, had been reduced to a wan shadow. This year it opened only on July 27, leaving scarcely enough time for California’s ocean-going boats to turn a profit. Some have ranged beyond the state’s waters, to Oregon, Washington or Alaska; others in the fishery shifted to crabbing. And others, like Sears, have tried to expand into other businesses, such as the fish market she launched on May 5 to backstop her fishing career. As commercial fishermen, we’re not asking for all the water, but just as much as we need to keep our businesses viable and our communities strong. There’s no question that the California salmon fishery is in a bad way. Stocks had barely recovered from the drought of 2007-2009, which destroyed the state’s inland spawning grounds and forced a total ban on commercial salmon fishing in 2008 and 2009, before a second drought struck. But a greater threat may be political, and man-made. Heather Sears has seen her catch dwindle as water is diverted to agriculture from rivers where salmon spawn. Agribusinesses in the Central Valley are demanding that more water be pumped out of the Sacramento-San Francisco Bay Delta to feed their farms. They’re getting a friendly hearing from the Trump administration and Republicans in Congress, who recognize that the valley is perhaps the only strongly Republican part of California. That water, allowed to follow its course through the state’s rivers and out to sea, is the lifeblood of the salmon fishery. Salmon spawn and hatch in fresh waters inland, then migrate to sea within their first year. They spend their next few years offshore, where they become the commercial boats’ quarry, until the survivors migrate back upstream and start the cycle again. It’s the portion of their life spans spent in fresh water, and therefore the health of the inland ecosystem, that determines the strength of the salmon fishery. In recent years, the ecosystem has come under stress from drought and diversions. To Sears, 38, fishing is a lifestyle, not just a job choice. “All I know how to do is catch salmon,” she said. Sears’ parents fished commercially out of Morro Bay, and first brought her along at the age of 8. She bought her first boat at 19, a 1928-vintage troller she acquired for $4,000. Her current vessel, the Princess, which she operates with an all-woman crew, is a 42-foot troller she acquired in Canada in 2008, when that country’s salmon industry underwent a shift from ocean fishing to salmon farming. (The boat was given its name by its previous owner.) It’s equipped with a blast freezer that can flash-freeze her wares to minus-40 degrees at sea, allowing her to stay out for a couple of weeks at a time and return with a larger catch. In a good year, she can earn $100,000, net of expenses. She’s right. Advocates of increased pumping for Central Valley farms typically talk as though the choice is between serving agriculture or allowing water to flow wastefully to sea to satisfy environmentalists. The interests of the commercial fishery are almost never mentioned. But it’s a big business too. A 2006 economic study valued the impact of the state’s salmon fishery at $1.4 billion in annual sales and 23,000 jobs. That was at a low ebb for the industry; if salmon could be restored to their full potential, the economists said, both figures would quintuple. Instead, the fishery has deteriorated. Only 42,000 Chinook salmon — the California species marketed as king salmon — were landed at the state’s coastal ports in 2017, according to the Pacific Fishery Management Council. As recently as 2013, the figure was 298,000. The value of the catch has been falling, dipping to $4.9 million last year, 9% below the previous year and 43% below 2015. Once in office, Trump fulfilled the deepest desires of agribusiness by installing as the No. 2 official at the Department of the Interior David Bernhardt, a former lobbyist for the Westlands Water District, which depends on water from the Central Valley Project. More than the health of the salmon industry is at stake in the conflict between the state and the Trump administration. Also affected are efforts by state officials to reconcile the water interests of farmers, urban dwellers, fishermen and others — a struggle over a scarce resource that has afflicted California politics for more than a century. Water administrators and environmental experts say they have noticed a stark change in the federal government’s approach to water allocations since Trump’s inauguration. The spirit of collaboration that — with few and brief exceptions — kept the federal Bureau of Reclamation and its Fish and Wildlife Service on the same page as the state Water Resources Board and other state agencies has vanished. It’s been replaced by policies through which the administration aims to deliver more water to politically friendly growers in the strongly Republican Central Valley, especially at the expense of fish and the people who depend on them for their livelihoods. That’s important because California’s State Water Project and the federal Central Valley Project both draw water from the northern part of the state and serve overlapping interests in Central, Southern and coastal California. Their mutual goal long has been to coordinate the projects to balance the needs of growers, urban users and fish and wildlife. After the severe drought of 2007-2009, it became clear that even draconian cutbacks in water pumping to farms had done little to protect fish such as Chinook salmon, steelhead, smelt and sturgeon. In 2016, the Bureau of Reclamation, which manages federally funded dams and reservoirs, launched a round of consultations with state agencies over biological opinions that designated those species as endangered. The goal was to strengthen environmental protections for the fish. Among other steps, the bureau has proposed changes in both the state and federal projects to “maximize water deliveries” to non-environmental users and consider “modifications to regulatory requirements” established by the biological opinions. Meanwhile, the Interior and Commerce departments have jointly proposed changes in the federal Endangered Species Act that would shrink the roster of species granted legal protections and loosen the rules protecting those that remain on the list. The administration responded with particular vehemence to the board’s initiative. In a July 27 letter to board Chair Felicia Marcus, the Interior Department threatened to sue the state over the proposed increases, arguing that the state was illegally trying to “co-opt” control of a federal project. That was a remarkable opening volley for a process requiring mutual consultation between two government authorities. “They’re certainly taking a far more confrontational approach than any previous administration of either party,” observed Richard M. Frank, an expert in environmental law at UC Davis. The letter asserted that, contrary to the water board’s position, federal law prioritized irrigation over protections for fish. Experts say that’s flatly untrue, because the Central Valley Project Improvement Act of 1992 explicitly gave fish and wildlife protection equal standing. The state’s right to dictate the allocation of water even from a federal project, moreover, was validated by the Supreme Court in a landmark 1978 decision saying, in effect, that federal water projects have to comply with state regulations. “On water law, we have a ton of our own authority,” Marcus told me. But the fishing industry can’t help but be fearful about how it will fare if the state and the Trump administration continue to wage war over water. “Structurally, we don’t have the protections we need,” said John McManus, head of the Golden Gate Salmon Assn. “Next time we go back into drought, it’s going to be as bad or worse than the last time. Our fully equipped, coastal home sits on three wilderness acres on the "middle Kenai peninsula". Being centrally located we are within 30 minutes of five rivers including the Kenai, Kasilof and Anchor and just 20 minutes north of the saltwater tractor launches in Ninilchik and Deep Creek. Most of our guests do a combination of fishing on their own and a day or three of guided river, fly-out or saltwater trips between self guided trips. With our centrally base location your options are unlimited. For all our guest's we include a three hour tutorial (at our Sebastopol home) covering tackle, tactics, best locations. We can also hook you up with some of the best guide, charter and fly-out contacts in the area. The three bedroom/ 2 bath cabin comfortably sleeps 6 and weekly rates are just $1600 per week (Sunday to Sunday). Additional info and pictures can be found here. USAFishing proudly supports the many fishery and wildlife organizations that benefit anglers and hunters throughout Northern California. Does your organization have an upcoming event? Contact us at fishsite@aol.com and we will gladly post your group's information on our reports pages.